The TARGET SHIELD offers a rounded elevated bull’s-eye target at the center of the shield. Seldom in football do you get a flat surface to strike! The bull’s-eye forces a blocker to bring the hands in tight. The rounded shape is an excellent surface for punching with the heels of your hands. It encourages keeping the elbows inside the frame of the body and maintaining tight hand placement and inside hand leverage. 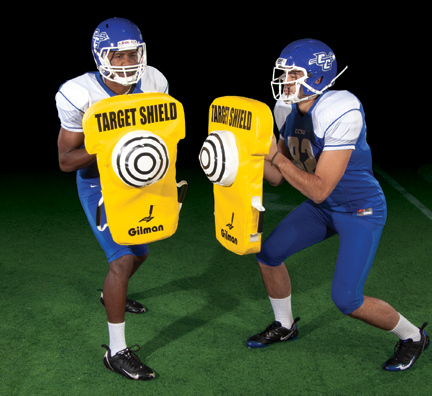 Use it in pass protection drills to give the blocker a narrow focused target to punch. Because the hands fit precisely around the bull’s-eye target, it’s a natural for thumbs up and heel of the hand punching! With this shield, taking “dead aim”, getting tight hand placement and shooting the hands with an upward punch becomes a habit.